ImoSweet™ is a sweet natural indigestible fiber. It has a good taste and about half the sweetness of sugar. ImoSweet™ is available as Powder or Syrup. ImoSweet™ has the Novel Food authorization since April 12th 2016. Isomalto-Oligosacharide has been available in China and Japan for about 20 years and is only recently available in Europe and the US. Beverages: Energy Reduced Soft Drinks, Energy Drinks, Sports & Isotonic drinks, Fruit Juices, Processed Vegetables and Vegetable Juices, Other Soft Drinks. • Cereal Products: Cereal Bars, Cookies, Biscuits, Breakfast Cereal Bars. • Sugar Confectionary: Hard Candies, Soft Candies, Chocolate Bars. • Nutritionally complete and fortified foods: Meal Replacement Bars, Milk based Meal Replacement. 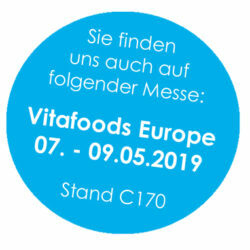 Desserts, fine bakery wares, beverages (flavored milks, fruit flavored powder mixes), edible ices, nutritionally complete foods, confectionary products (sweet sauces, toppings), ready-to-eat savories and snacks. Low Calorie Sweetener: About half the calories of sugar. • Natural Sweetness: up to 50% sweetness of sugar and 60% of sucrose. • Prebiotic Fiber: It has been shown to promote the growth of beneficial bacteria in the colon. • Bulking Agent: It adds bulk and texture to processed foods. • Browning effect: It promotes desirable browning during baking. • Fat Replacer: It promotes a creamy structure with the same mouthfeel as fat. • Increased satiety: It is a soluble fiber and increases the feeling of fullness. • Non-cariogenic: It does not promote dental cavities. • Minerals Absorption: It has also been shown to assist the body‘s ability to absorb minerals from food. The bulk density of ImoSweet™ powder is similar to sugar or flour. ImoSweet™ is stable at temperatures from 160° C – 180° C and therefore perfect for bakery products. ImoSweet™ is stable at pH 2-8 for some time and therefore suitable also for use in functional beverages. Though it is naturally occurring (f. e. in Honey), it is not economically viable to extract it. Instead it is produced from cornstarch. The starch is converted into maltose syrup using enzymatic hydrolysis. This maltose syrup is then treated further with enzymes to convert the glycosidic linkages into a not digestible form containing 3 to 6 glucose molecules. ImoSweet™ has certain beneficial properties similar to Oligofructose and Inulin. Like these it is made up of carbohydrate chains that are resistant to digestion, and therefore low in calories. However it differs in that the carbohydrate in the chain is glucose not fructose. 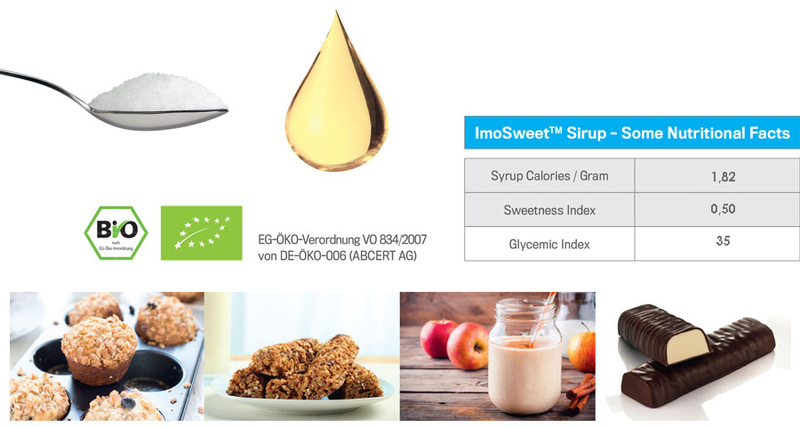 ImoSweet™ consists of usually 3 to 6 glucose molecules bound with an indigestible glycosidic linkage. The stomach is unable to break the linkage to free the glucose, so it passes into the colon without being metabolized. Please contact us for further information, or samples, etc. !